Johnson Level offers a variety of quality, durable and and reliable measuring tools. The following review explains how Johnson Level's measuring tools are a great value and deliver the same, or better, results than the more expensive brands. This review covers three different tools offered by Johnson: the pocket rule, heavy duty combination square and an aluminum meter stick. This review was done by Tom Hintz from New Metalworker and can be viewed in it's original form at NewMetalworker.com. 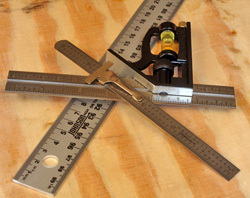 Quality measuring tools are essential to building accurate projects. The Johnson Level and Tool offerings are both well made and surprisingly economical. People who work with wood or metal go to great lengths to create attractive and useful projects. They frequently buy high-dollar equipment to support those efforts but all too often buy whatever the local home center has on sale when shopping for measuring devices. I understand trying to get the most value for our tool dollars but using cheap as the primary shopping criteria makes frustration a virtual certainty. In this review I look at the offerings from Johnson Level and Tool which prove that we can get the accuracy we need at prices we like. I like that kind of value. 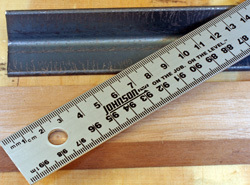 Johnson Level and Tool has been a leader in many forms of measuring and their line of metal rules is no exception. The components are cleanly manufactured and the all-important graduations are clear and easy to read. 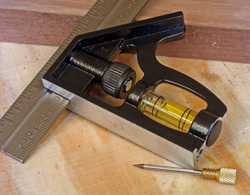 Because the United States is one of the only countries on this planet that continues to resist the metric system, Johnson Level and Tool makes rules with both metric and Imperial markings as well as individual tools with one type of marking or the other. Now if we can just get people to learn from what is often right in front of them! The 6" Pocket Rule comes in very handy more than you might think. I use it often when working with metal or wood! The sliding clip (right) also acts as a depth stop or marker. One of the most useful rules I have is the simple-looking, 6" pocket rule. If you stop and think about what we do in home-based metal or woodworking shops a 6"-rule can handle many of our common tasks. The combination of pocket portability and fine resolution markings makes this a handy tool for lots of critical measurements. The Johnson Level and Tool 6" Pocket Rule (Model 7202) is made from stainless steel for long-term durability. This rule has clear scale markings divided into 1/32"-graduations along one edge and 1/64" markings along the other. The back surface of the Johnson Level and Tool Pocket Rule has decimal equivalents grouped in 1/8, 1/16, 1/32 and 1/64" ranges. I can't tell you how handy this information is or how often I pull this rule out of my pocket to convert a caliper reading. Of course the Johnson Level and Tool Pocket Rule has the familiar sliding pocket clip that too many think makes them look like a nerd. (If you look like a nerd chances are that it's not the clip on this rule causing it....) In addition to keeping the Pocket Rule in your pocket the clip can be used as a marker or a stop that allows you to return to a specific setting. I have also used the clip to measure the depth of larger holes or the thickness of material that I have lying on the bench. The thin stainless body is very flexible making it easy to do layouts or measuring on curved surfaces. The 6" Combination Square (left) is frequently used in metal and woodworking and can have a dramatic impact on how a project turns out. The cast zinc head (right) has an easy to read leveling vial and a screw in hardened scribing pin. Both are nice touches. 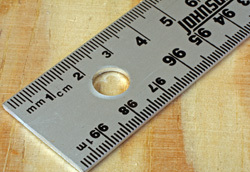 Another "can't work without it" measuring tool for many of us is the 6" combination square. We use this tool for drawing layout lines, including long lines that run parallel to an edge. Thousands of table saws have their blade height set with a 6 combination square every day. Router bits also owe their precise depth setting to the combination square. The Johnson Level and Tool Heavy Duty 6" Combination Square (Model 406EM) has a tough steel blade with inch and metric scales on both sides. One side has Imperial gradations in 1/16th-inch resolution and 1/32" graduations on the other side. 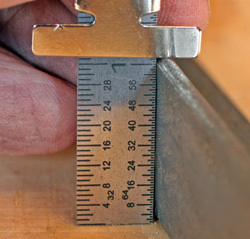 Notice that both sides of the blade have the same 150 mm scale along one edge because the metric system is uniform. With this dual scale so commonly found on "American" rules you would think that we would be better at using the metric system but I am not and I suspect many of you aren't either. The cast zinc head of the Johnson Level and Tool Heavy Duty 6" Combination Square has 90-degree and 45-degree bosses milled into it. The blade can be locked at any position by a familiar thumbscrew. An oversized spirit level vial is built into the head on the 90-degree axis to make checking for plumb an easy task. The head also contains a hardened scribe pin. What is a bit different is that Johnson Level and Tool gave this pin a screw in mount rather than a friction fit retention system that causes this pin to mysteriously disappear from combinations squares made by so many other manufacturers. The current street price for the Johnson Level and Tool Heavy Duty 6" Combination Square is only $10.00 (2-10-2011). The all-metric Meter Stick (left) is clearly printed with metric scales on both edges. I like having the dual metric scales (right) because it simplifies many setup chores. I can't convert metric to Imperial units in my head and trying to read them correctly from the other side of a rule just is not accurate. this is. Like many of you I have tried to use the metric side of a yardstick to convert "foreign" dimensions. Because we want an Imperial scale on the same tool, the metric side can be running in the wrong direction. There really is but one way to fix that and that is the Johnson Level and Tool Meter Stick (Model 3900) shown here. This device has two 1-meter scales in cm resolution (100-cm per meter, get used to it!) along both edges of one side. Because they are not trying to get fancy with multiple units of measure we only need scales on one side. The aluminum Johnson Level and Tool Meter Stick is 1-meter long and 30 mm wide. (That's like 1-1/8" or so) This rule is very flexible which makes laying out or measuring surfaces that are rounded or otherwise not flat easier and more accurate. 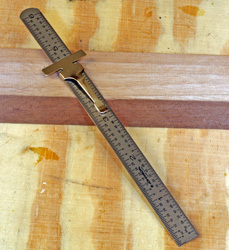 The street price for the Johnson Level and Tool Meter Stick is $5.95 (2-10-2011). The Johnson Level and Tool measuring tools shown here are very accurate and well made. Johnson Level and Tool has been around for a very long time because they make durable, useable tools that lots of people buy. That popularity is at least partially responsible for the often surprisingly low price on these tools. They are also available in most better tool outlets and home centers. If you like to build projects whether they are in metal or wood, Johnson Level and Tool has the measuring devices you need to do the best job. 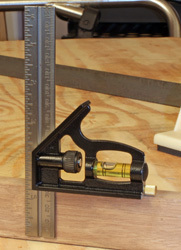 Nothing can ruin a project quicker than dimensional errors and many of those are instigated by cheap measuring tools. Give yourself a break and buy the good measuring tools you and your projects deserve. Thanks to Johnson Level and Tool you can get that quality without over stressing the budget.